Artist's concept of the two Gravity Recovery and Interior Laboratory (GRAIL) spacecraft orbiting the moon. NASA launched the twin probes in September 2011 to study the moon's gravitational field in unprecedented detail. This story was updated at 5:02 p.m. EST. The first of two gravity-mapping NASA spacecraft entered into orbit around the moon today (Dec. 31), marking a New Year's arrival in a mission that will study Earth's nearest neighbor from crust to core. After three months of spaceflight, the Grail-A probe fired its main engine at 4:21 p.m. EST (2121 GMT) today in a 40-minute manuever to enter lunar orbit (Dec. 31), according to NASA officials. The spacecraft's twin, Grail-B, is slated to follow tomorrow (Jan. 1) at 5:05 p.m. EST (2205 GMT). "Burn complete! 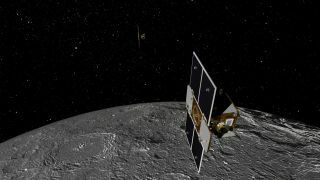 #GRAIL-A is now orbiting the moon and awaiting the arrival of its twin #GRAIL-B on New Year's Day," officials from NASA's Jet Propulsion Laboratory in Pasadena, Calif. confirmed via Twitter. After gradually circling down to super-low orbits, the pair will zip around the moon in tandem, working together to map the lunar gravity field in unprecedented detail, researchers said. Scientists expect the probes' measurements to help unlock some longstanding mysteries about the moon's composition and evolution — mysteries that remain unsolved despite more than 100 missions to the moon over the years. "You might think that, given all of these observations, we would know what there is to know about the moon," Grail principal investigator Maria Zuber, of the Massachusetts Institute of Technology, told reporters Wednesday (Dec. 28). "Of course that's not the case." Scientists think the moon formed after a Mars-size body struck Earth about 4.5 billion years ago. This titanic impact blasted huge amounts of material into space, and they eventually coalesced. While this basic outline of the moon's origin is pretty well established, many mysteries remain about how the rocky body has evolved since then. Chief among these puzzles, perhaps, is why the near side of the moon — the face we always see from Earth — is so different from the far side. For example, plains of volcanic rock (called maria) are much more widespread on the near side, and the far side is higher and more mountainous, with the lunar surface 1.2 miles (1.9 kilometers) higher in elevation, on average, than the near side. "We don't actually know why the near side and far side of the moon are different," Zuber said. "We think that the answer is locked in the interior." One possible explanation, proposed by researchers this August, is that the gigantic collision 4.5 billion years ago actually created two moons. The second moon, which was much smaller, later slammed into our moon's far side, the idea goes, spreading itself over the surface rather than creating a crater. The Grail probes' observations could help determine whether that scenario is accurate, researchers said. "We believe that we can obtain the information that we need to test this hypothesis," Zuber said. An artist's concept of the moon's interior. NASA's twin GRAIL probes will gather data that should help scientists better understand the moon's composition and evolution. The $496 million Grail mission (short for Gravity Recovery And Interior Laboratory) launched Sept. 10. The two washing-machine-size probes then spent more than three months making their slow, circuitous way to the moon. By comparison, NASA's manned Apollo 11 mission in 1969 reached the moon in three days. But Apollo 11 prioritized speed, while Grail's path is energy-efficient and has given engineers ample time to assess the probes' health and charge up their scientific gear, researchers said. Grail-A and Grail-B still have some work to do from their initial lunar orbits to get into position. They'll spend two months circling lower and lower, eventually settling into orbits just 34 miles (55 kilometers) above the lunar surface by March. Regional differences in the lunar gravity field will cause the two spacecraft to speed up or slow down slightly, changing the distance between them as they fly. Bouncing microwave signals back and forth off each other, Grail-A and Grail-B will gauge these tiny distance variations constantly. The Grail team will use the twin probes' measurements to construct highly detailed maps of the moon's gravitational field. These maps are expected to reveal a great deal about lunar composition, allowing scientists to draw insights about how the moon formed and how it has changed over time, researchers said. Public outreach and education are a big part of Grail's mission as well. Each spacecraft is carrying four cameras and will snap photos of the lunar surface at the direction of middle-school students across the country. Students will get to pore over these pictures after they're beamed back down to Earth. The photo project — which is called MoonKam and is run by former NASA astronaut Sally Ride — has already generated lots of enthusiasm. More than 2,100 schools have signed up to participate, according to Zuber. "We've had a great response to the MoonKam project," Zuber said. "We're still accepting applications. We can accommodate another several hundred schools into the program if there's interest in doing that."